Spain Heading Towards Civil War? Tomorrow, Catalonia will attempt to hold an independence referendum; I say attempt because they will face extremely strong opposition from the Spanish federal authorities, not least in the form of the tens of thousands of paramilitary Guardia Civil that Madrid has sent into the region to prevent what Madrid insists is an illegal action. Madrid has cited the Spanish constitution and its article 8 which declares Spain to be ‘indivisible’ as justification for declaring the Catalan referendum illegal and it’s efforts to prevent it going ahead. Spanish Prime Minister Mariano Rajoy has already reiterated many times that a referendum cannot be held as it would be contrary to the Spanish constitution, introduced in 1978 to underpin Spain’s transition to democracy after the death of the great dictator himself, Francisco Franco. So far, we have seen the Guardia Civil and Spanish police seize ballot papers, arrest local Catalan mayors and officials and seize many polling stations, in short, they are using force rather than negotiation and appear to be determined to continue to use as much force as necessary to prevent the referendum vote going ahead. The intimidation by Spanish forces has been steadily growing in recent weeks; last weekend, Spanish naval vessels prevented the fishing fleet from the Catalan port of Gerona from putting to sea because they were not flying the Spanish national flag; the fishing vessels had to return to port and were unable to fish. This bellicose rhetoric sounds like a deeply unpleasant and disturbing echo of the old fascist regime of Franco and it should not be forgotten that Barcelona, the capital of Catalonia, was the stronghold of the Republicans during the Spanish Civil War and fought to the last against Franco’s Nationalists and their German and Italian fascist allies. In the Spanish Civil War the international community including the European democratic powers of Britain and France did nothing to help the democratically elected Spanish Republic and stood idly by while Franco, with much help from Hitler and Mussolini, brutally crushed Spanish democracy and freedom. The only help the Spanish Republic did receive was in the form of tens of thousands of foreign volunteers who came to fight fascism and the dubious assistance of Stalin who supplied weapons but also sent political commissars who attempted to foster a Communist takeover within Republican ranks. The Catalans clearly fear a repeat of the brutality and violence of the Franco era; in Brussels last week four Catalan MEP’s asked the European Commission to inform Spain that it could not use military force to stop Catalonia from breaking away from Madrid. The MEPs Maria Badia, Ana Miranda, Raul Romeva Rueda and Ramon Tremosa also wrote to the EU justice commissioner. However, it looks like the international community and the European nations will once again stand idly by and not involve themselves in Spain’s affairs. This is probably largely motivated by a desire to avoid giving a boost to other nascent independence movements across Europe, such as the Bavarians, Basque, Walloons and Scots. The Catalans do not want violence, they are trying to do things in a calm and peaceful manner, but the heavy-handed reaction by Spanish authorities in Madrid smacks of the bad old days of Franco and fascism when Catalan identity was brutally suppressed to the point where the Catalan language could only be spoken in private or in the safety of numbers such as on the terraces of the famous Nou Camp football stadium in Barcelona. The Catalan police, controlled by the Catalan local government in Barcelona has so far done nothing to either hinder or assist Madrid’s use of force, however, this may change if the heavy-handed intimidation tactics continue – the Catalan police may be forced to act to protect their own people, should Madrid’s forces resort to violence, which is a very real possibility, given the notorious reputation of the Guardia Civil. It is not hard to see how a flashpoint confrontation could easily occur tomorrow when the Catalan people attempt to vote; all it would take is some hot-headed Guardia Civil officers using excessive force to stop them and it could all ‘kick off’. How long would the local Catalan police be able to stand aside before feeling they must intervene in order to protect their own people from being beaten and injured? The first Catalan policeman shot and killed would become a martyr, a potent symbol of the brutality of Madrid’s attempted repression of the Catalan desire for independence and a multiplying factor that would greatly boost the calls for freedom from Madrid’s grip. It is only 40 years since Franco, the fat little tyrant in Madrid died and the reign of cruel oppression that sought to crush the Catalan identity finally ended; still within living memory of many Catalans. It is not hard to see how we could easily see the eruption of a renewed spirit of open defiance and violent resistance to Madrid’s attempted repression among young Catalans, spurred on by cries of ‘never again’ and an outpouring of a fervent desire to not fall victims to the same fate as their parents and grandparents who suffered at the hands of Franco and his facists. Spanish national police have sealed off 1,300 of 2,315 schools in Catalonia designated as polling stations for the banned independence referendum, the government in Madrid says. The move came as the Spanish authorities stepped up their attempts to stop Sunday’s referendum. Police have now occupied the regional government’s telecommunications centre. Catalonia, a wealthy region of 7.5 million people in north-eastern Spain, has its own language and culture. It has a high degree of autonomy, but is not recognised as a separate nation under the Spanish constitution. Tens of thousands of people are expected to vote in Sunday’s ballot, which has been declared illegal by Spain’s Constitutional Court. The authorities in Madrid have sent thousands of police to the region to stop it taking place. They have been ordered to clear schools occupied by activists – including parents and their children who remained in the buildings after the end of lessons on Friday – aiming to ensure the buildings can be used for voting. Officers from the Catalan regional police have been instructed to assist, but also told not to use force. A government source quoted by Reuters news agency said 163 schools had been occupied by families. Officers have have also been seizing items such as ballot papers, while prosecutors have ordered the closure of websites linked to the vote and the arrest of officials organising the referendum. Catalan leader Carles Puigdemont told Reuters news agency that the referendum would go ahead. “Everything is prepared at the more than 2,000 voting points so they have ballot boxes and voting slips, and have everything people need to express their opinion,” he said. Friday saw thousands of Catalan separatists hold a final rally in the city of Barcelona. 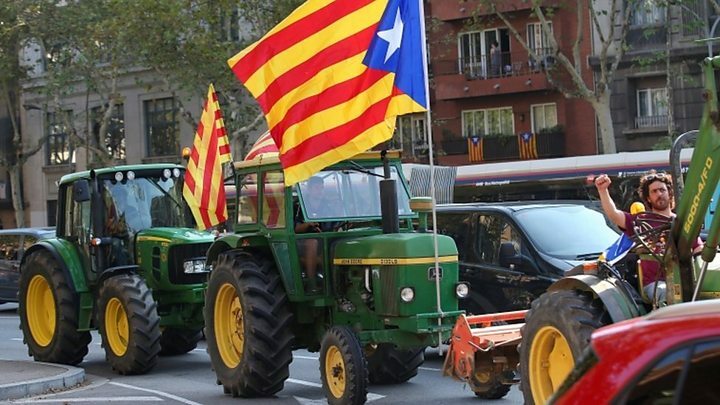 But in the town of L’Hospitalet de Llobregat, some 2,000 people opposed to independence attended a rally called by Ciudadanos, Catalonia’s main opposition party. Friday also saw a judge order media giant Google to remove an application giving information about the outlawed referendum. Pressure for a vote on self-determination has grown over the past five years but in the 2015 regional election, won by an alliance of pro-independence parties, about 40% of voters backed parties loyal to Spain. Spanish unionists argue Catalonia already enjoys broad autonomy within Spain, along with other regions like the Basque Country and Galicia.